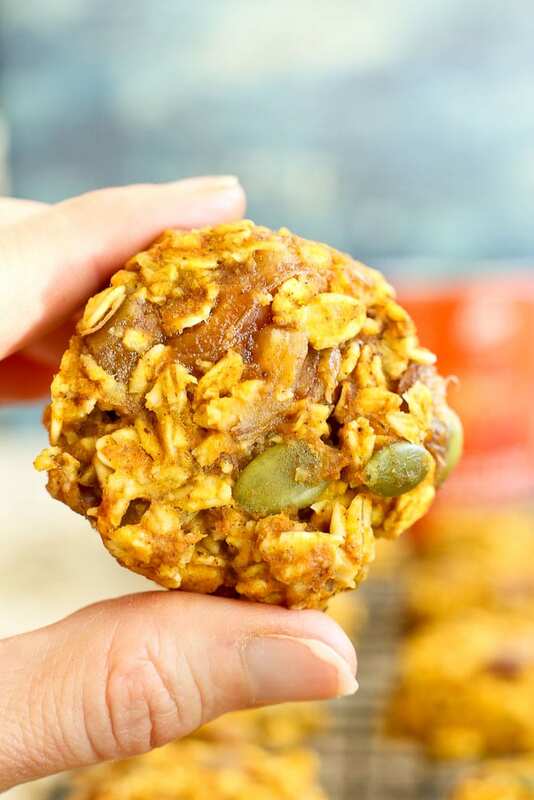 I can’t think of a tastier way to start your morning than with wholesome Pumpkin Breakfast Cookies! Heads up! This post was first published in 2012. I updated a few pictures and left some for context, as the text remains the same. The title of this post is a little deceiving. I am calling these pumpkin cookies “breakfast cookies” because I set out to create a cookie that was a healthy-enough-to-eat-for breakfast cookie. These definitely are. But these Pumpkin Breakfast Cookies are also great snack cookies, lunch cookies, dinner cookies, or whenever-you-want cookies. Basically, a cookie that has enough nutrients to warrant eating it outside of dessert. And I know I am totally jumping the gun on the pumpkin thing. It’s early September, the end of summer, and I should savor the last of summer’s best flavors. I think it’s the extraordinarily hot and dry summer we had that has me pining for fall. Fall weather, fall clothing, and fall flavors. I want it all. So I’m sorry for bringing you this pumpkin recipe a little early. I think if you give it a try, you’ll forgive me. 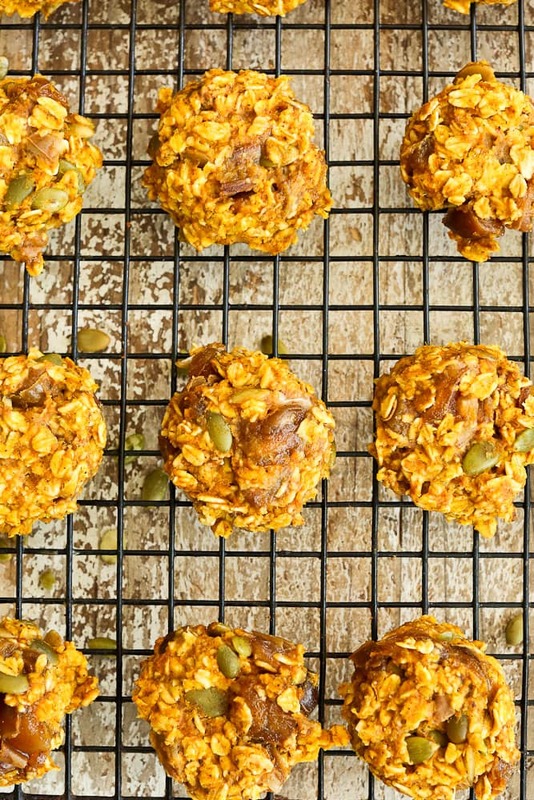 These Pumpkin Breakfast Cookies deliver a lightly sweet, deliciously fall-spiced flavor. The pumpkin seeds give a slight crunch that is perfect. The best part is they are easy to prepare with just one bowl. 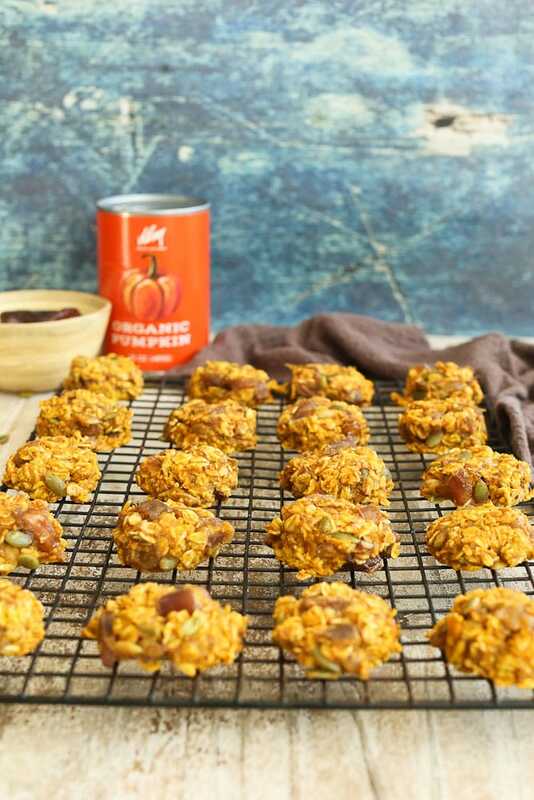 These healthy Pumpkin Breakfast cookies are gluten-free, dairy-free, and totally delicious! Preheat the oven to 350 degrees and line a baking sheet with parchment paper (or lightly oil) Mix all ingredients in a bowl until well-combined. Form into small, one inch balls, flatten, and place on cookie sheet. Bake for 12-15 minutes, until the cookies are starting to get lightly brown. Enjoy! 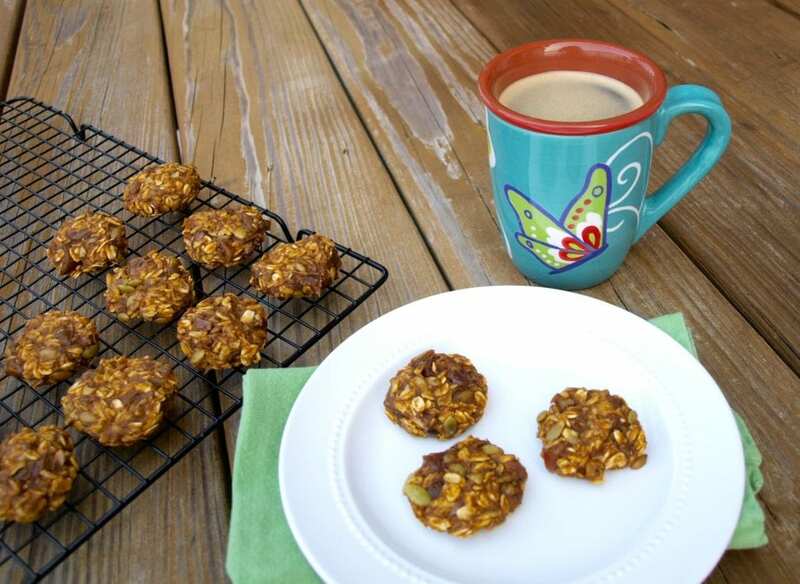 Want more cookies healthy enough to eat for breakfast? Check out my Applesauce Breakfast Cookies! Meghan’s been really into taking pictures lately. Every time I pull out the camera, she asks if she can take a picture. Usually she just wants to take pictures of Luke or Tim and me, but this time she asked to take a picture of the cookies. I snapped a picture of her with my iphone taking some photos. Not bad for a 3-year-old, right? Looks better than most of my early pictures on here! 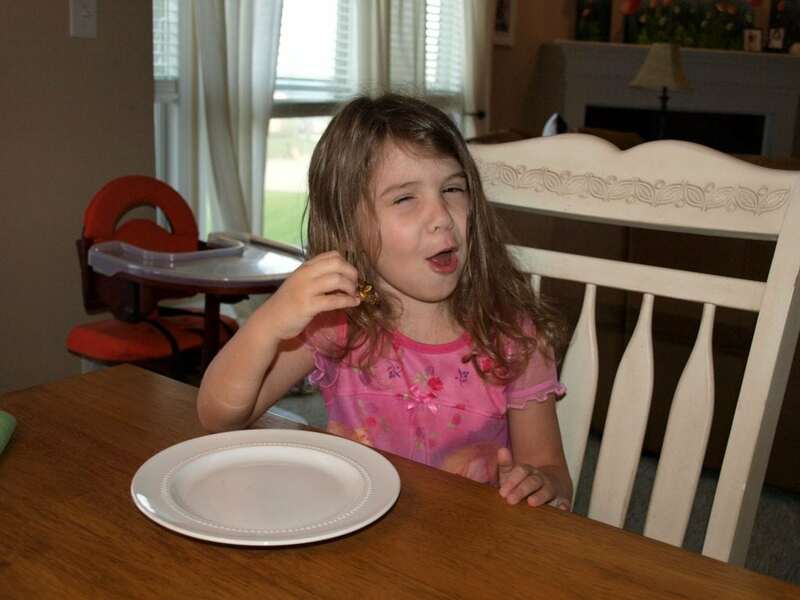 She insisted on eating a cookie when she was done with the pictures. She loves making silly faces for the camera. Any chance I could use a flax egg instead? We just moved & I haven’t found a local farm to buy eggs from yet & I refuse to buy them from the store. Just not sure how many flax eggs to use because you did the egg white, also. Can’t wait to make these for the kids’ lunch boxes……I love all things pumpkin! I think a flax egg would work fine. I only used the egg white because Luke’s been eating just the yolks and I need a way to use up the whites and thought it would be good to boost the protein a little. I don’t think that one extra white is totally necessary to hold the cookies together or anything, so I do think a flax egg would work. Let me know if you try it! Although I’m not quite ready for fall inspired food, these look great! They sound and look delicious. The picture of Meghan is sooo cute taking the food photo! I can’t believe she took that picture! Aw! Simply adorable- I love how children want to be just like their moms and dads! I haven’t tried it, so I can’t say for sure, but I do think that a flax egg would work for these. Let me know if you give it a try! Love the shots Meghan took! And, in that last picture of her, she looks so much like your husband. I have been looking for a recipe like this! 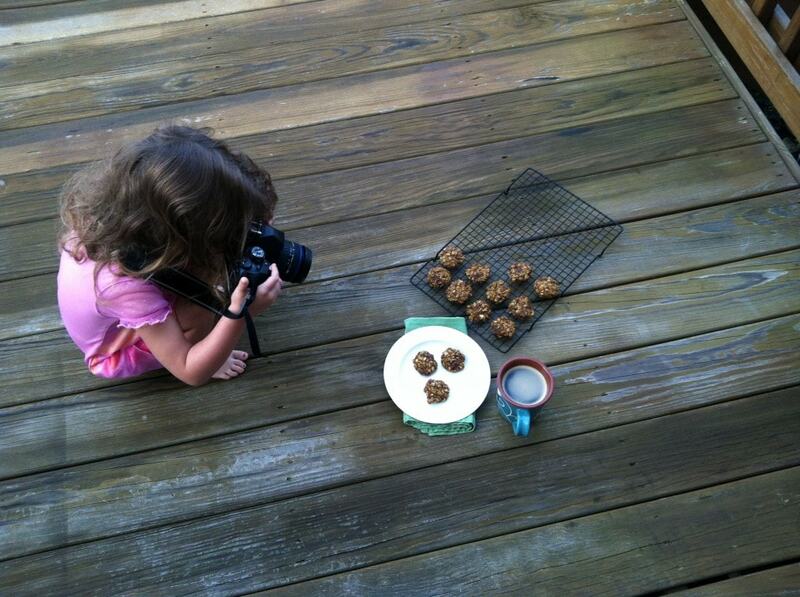 Meghan is definitely a food-photographer in the making. That is a great photo! Go Meghan! I am bookmarking this for a later time. For when I can fully accept the end of summer. Until then, pumpkin is dead to me. I love the photo of Meghan taking photos. She looks like a natural! Today was cold and rainy in Colorado and I knew your blog would have the perfect HEALTHY fall recipe!! I made these, but didn’t have coconut oil (subbed in olive oil) or pepitas (subbed in walnuts). They are super yummy and I will make them again, hopefully with coconut oil and pepitas next time. Is there a trick to chopping ONE WHOLE CUP of dates, or buying ones that are already chopped? Oh wait! I just realized I used prunes instead of dates. So I guess I made 3 substitutions, but overall the recipe was still good! Thanks Maryea! I just made these today and they are yummy! I did everything the same, but I added a few chocolate chips to make them more kid-friendly (baby-steps :). The kids have eaten them and approved! In fact, my toddler loves them & keeps pointing & saying “tookie”. Thanks for another great recipe! Quick question: I just purchased some coconut oil but when I add it to recipes, should I melt it first? It seemed to be hard to mix in the batter & kinda stayed in little clumps. When I melt it before using it, I indicate “melted” in my recipes. It depends how you are using it if its necessary or not. When I’m using it in place of something like vegetable oil, I melt it first. If I’m using it in place of butter, I don’t (unless melted butter would normally be used). what should I feed a Pike? Hi, great receipe. Can I use real baked pumpkin instead of canned? Canned pumpkin is real baked pumpkin. 😉 But yes, if you’d rather use fresh that should work. Although I have not tried it so I can’t say for sure. I can almost smell this baking from here, delicious.